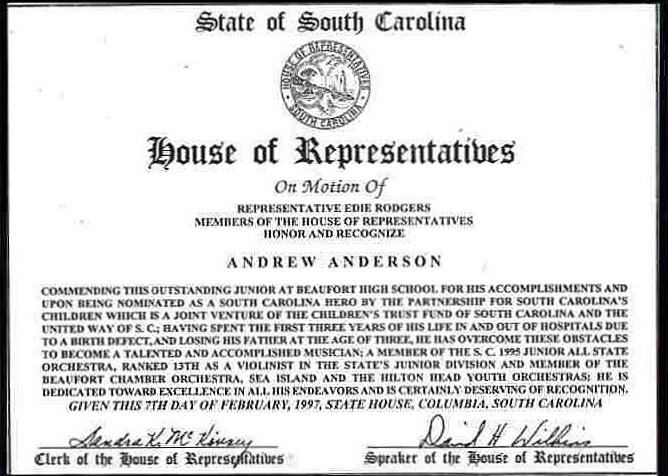 Andy was honored by the South Carolina House of Representative as the recipient of the Governor's Award. Noted were his accomplishments in music as a talented musician with the Junior All State Orchestra, Sea Island Hilton Head Youth Orchestra, and the Beaufort Chamber Orchestra. Also noted were the struggles and obstacles which Andy had to overcome as a small child. This award was presented to Andy in 1997 for demonstrating extra-ordinary achievements in the fields of art, music and academics and also for overcoming severe obstacles in his life. Andy's early childhood was spent in and out of hospitals. Andy and his proud mom, Karen Anderson, at the Governor's Mansion in Columbia, South Carolina.